Keeping Up With the Kapenga's: Finally a new post...sorry so long! Finally a new post...sorry so long! Wow...I have been a blog slacker lately and was reminded last night by my sister-in-law Megan that I haven't updated in almost a month and she doesn't have anything new to read while at work :-)! My lack of blogging really has nothing to do with laziness or the fact that nothing new is going on since it's actually been quite the opposite around the Kapenga household. It is in part because for 2+ weeks we had no computer since ours had some major issues thanks to a virus and access to a computer and "working from home" meant going to my moms house. The computer is back now and we're keeping plenty busy with summer, the new house, packing up at the old house and that little thing called pregnancy! With my sister being off school for the summer we've gotten to spend more time with her and Allee. Jenna gets very excited when we have to babysit one of her cousins. She thought Allee was big enough for the burley so one morning I got my pregnant body on the bike and pedaled them around Zeeland....of course we ended up at the Zeeland Bakery! 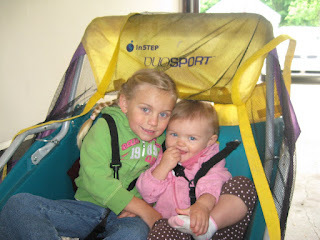 Jenna isn't the heaviest kid on the block but you put her and Allee together and I got a pretty good workout. 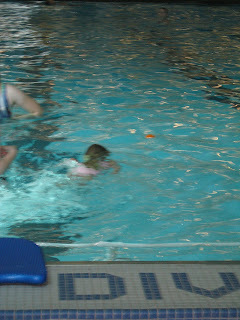 Jenna continues her LOVE of swimming, I never would have guessed this about her. 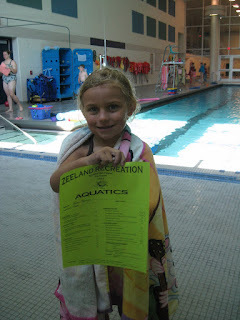 She took swimming lessons for two weeks through Zeeland Rec and it went better than I would have ever guessed. Other than being a little scared the first day that she was going to get stuck with the only boy teacher (I'll remind her when she's 13 that she didn't used to like boys), she did fabulous and was swimming all on her own. Her favorite way to swim, because she figured out it was the fastest, is to be completely underwater....with her eyes open which is a little creepy when she's swimming towards you! She was really proud of all the "+" signs she got from her teacher on her certificate. And yet more things are changing around our house. We will be moving out of our house on the 18th of July and in with my mom. We've been busy packing and figuring out what needs to come along for us as well as baby and what stuff can be put into storage. This week the less than perfect summer weather has actually made me much more productive. I am the first one to love a good 90 degree summer day but when your house has no air conditioning and you need to be packing it's not that much fun. 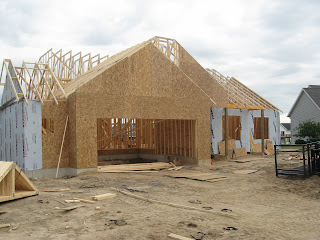 Our house is coming along nicely and faster than we anticipated up to this point. I know from experience things will slow down and progress will be less noticeable but as for now we are super pleased with the AWESOME job Ross is doing for us. Dave's brother-in-law is the official "roofer" and is working on that project now. We are not doing much of the house ourselves but roofing was one are Dave planned to do....but having Ryan's experience and expertise was needed...don't want a leaky roof! Next week is windows, doors, and lots of rough in on the mechanical side of things. Then it's on to siding and drywall. It certainly is not a huge house by any stretch but since we currently live in 770 square feet it seems huge when we are there. 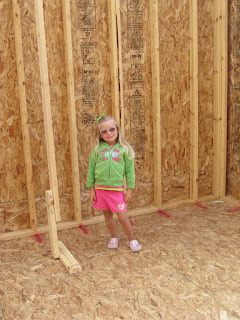 Jenna loves going to the house, playing in the dirt and picking up the wood. She is meeting lots of great little kids who will be her new neighbor friends! She has also picked out her bedroom and has decided it will be pink, purple, blue and sparkles....mmmm....might have to work on that a little bit. Here's Jenna staking her claim to her new bedroom. Last but not least, pregnancy. It is going SO fast. I am currently 32 weeks and getting bigger and bigger. 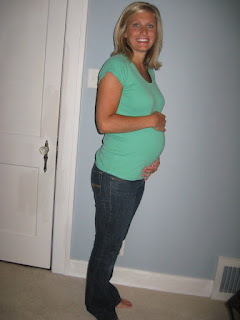 Thanks to Jenna for taking my picture this morning so we can show off this growing belly. I really don't mind being pregnant and the only thing I can complain about is the awful heartburn/acid reflux that started 2 weeks ago. I didn't have either with Jenna so I wasn't expecting it. The baby is still really high which makes breathing and sitting a little uncomfy at times but I know the baby will eventually drop. I still can't believe I only have 8 weeks to go....kind of scary with all we have going on right now! That is plenty of boring info on us right now. I hope everyone has a great 4th of July!!! Are you sure you're 32 weeks, not 22? :) You look amazing! Can't wait to meet the new little one. Jenna's 4 Year Pictures....Oh my!! !